Cepheid variable stars are most commonly known as a standard candle for measuring galactic distances. That’s because they vary in brightness at a rate proportional to their average brightness. But they can also tell us something about how young stars are distributed within our galaxy, and a recent study raises an interesting mystery. There are basically two types of Cepheid variable stars. Classical cepheids are large bright stars, typically with a mass 5 – 20 times that of our Sun. Since larger stars have shorter lifetimes, a classical Cepheid is typically no more than 100 million years old. Type II Cepheids are small, old stars, with masses much less than our Sun. They are typically around 10 billion years old. Distinguishing between these two types of Cepheid variables is straight forward, because they have very different metallicities (traces of elements other than hydrogen and helium). So we can distinguish them by looking at their spectra and the way they brighten and dim (their light curve). Because classical Cepheids are brighter, they are typically used to determine the distances to galaxies, and helped establish the Hubble law for cosmic expansion. The dimmer type II Cepheids are typically used for distances within our galaxy, such as determining the distance to the center of our galaxy. Since the ages of these different types of Cepheids are very different we can use them as a gauge for the age of surrounding stars. For example, if a globular cluster contains type II Cepheids, we know it is billions of years old. If a star cluster contains a classical cepheid, we know that stars formed there relatively recently. A new paper in MNRAS uses this fact to look at the distribution of young stars in our galaxy, and found a rather puzzling void. Mapping young stars in our galaxy can be a challenge, particularly in the direction of the center of our galaxy, where high amounts of gas and dust obscure most of the visible light from distant stars. Fortunately infrared light isn’t absorbed as strongly, so an infrared survey of Cepheids gives us a good view of the central region of the Milky Way. This new study found some classical Cepheids clustered very close to the center of our galaxy, but found a region about 8,000 light years in radius where there aren’t any classical Cepheids. This would seem to indicate that this region hasn’t produced stars in at least 100 million years. This is in agreement with infrared and radio surveys of the central region of our galaxy, which also find a lack of star producing regions in that area. We don’t know why stars don’t form in this region. There is certainly plenty of matter in the region, and older stars are clearly present there. For some reason the conditions for young stars are lacking there, producing a cosmic “get of my lawn” effect. But the MW is not unusual, among spirals, in this regard, is it? I mean, rather a lot of spirals do seem to have active star-formation in/near the nucleus, and out in the arms, with not much in between. Particularly if they’re barred spirals, which the MW is. Indeed, one of your blogs – “Raising the Bar” – has an image nicely illustrating this! I’ve seen it claimed elsewhere that magnetic fields are a factor in star formation. 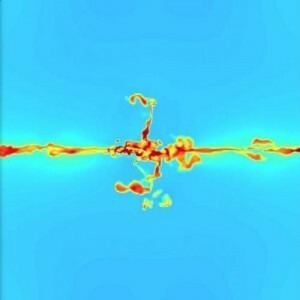 Supposedly, magnetic fields affect the turbulence that leads to star formation. So, maybe we are talking about a region of the galaxy where the magnetic flux is less than elsewhere. Don’t know if the paper considered that, as I could only read the abstract.